A rescue operation at Angeles national forest that had been organized to search for a missing hiker became a blessing for another family, when their toddler was saved from drowning by the rescue team. Members of the Montrose Search & Rescue Team were at the national forest to search for a missing hiker from Bakersfield on Friday evening when they came across another girl who needed their help. At around 5.00 pm the team found a toddler face down near a creek at the Stonyvale Picnic Site, off of Big Tujunga Canyon road in the Angeles National Forest north of La Crescenta. “Members of one of three teams came upon a 1-and-a-half-year-old girl, face down and lifeless in a pool of running water 200 yards away from the picnic area,” sheriff’s officials said in a statement. Search and rescue team commander and reserve sheriff’s deputy Janet Henderson, who is also an emergency room nurse at Huntington Hospital in Pasadena, and sheriff’s Reserve Chief Michael Leum found they girl in the water and rushed to help her. Janet told news crews that she and her team members had only joined the week long search operation on Friday. On hearing her shout, the mother of the baby girl rushed to the spot and picked her. She had turned blue and was unconscious. The mom handed her daughter to Leum. “Mike slapped her on the back a couple of times, which actually made the baby expel some water,” Janet said. The girl began to slowly recover even as a helicopter came to take her to the nearest hospital. 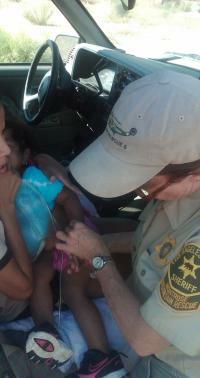 The sheriff’s office said that the girl was sitting with an adult and another three year old child near the creek. When the adult left the one and a half year old girl for a few minutes, to chase the other child who was running away, the girl fell into the water. Ertug Ergun, a 33-year-old engineer and Turkish national from Bakersfield, was reporting missing June 20. The man is an avid hiker and had informed his friends about the recent trip. The rescue operation was launched after his car was found in a parking lot at the picnic site. The search is still on. Thankfully the child who nearly drowned was released for the hospital on Saturday morning.